so here i am, monday morning. 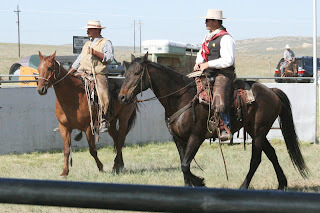 made it through the 26th annual powder river sheepherder's fair, and what a good time it was. the weekend really started with friday night, during which i had to work at the church from 5:30 to 10:30, and after which natasha texted me and wanted to know if i was going out. since i bailed on her (because of bad mood) the previous weekend, i figured i'd go out and say hello. (she's been at basic training for national guard for a while now). so i get to the bar at 11 and meet up with friends casey, brian, molly and stuart and commence to sip my pendleton. (that was my bartender gavin's choice for me that night, i guess. i didn't have any say in the matter). long story short, natasha never showed up and i spent a lot of money in a hurry. that'll happen when you buy all your friends several rounds of shots. :-P we all crashed at casey's and the next morning i got a ride back to my truck and proceeded to powder river after gathering a few clothing items and blankets for sleeping in my truck (but i should have grabbed more. i woke up freezing about 4 sunday morning). roommate amanda was already out there, so i joined her behind the bar to begin my official position as bartender. by the end of the night all the guys would address me as 'barkeep.' we had budweiser and bud light on tap, and i'm now a pro at pouring beer. that foam can be a challenge sometimes. we must have been good bartenders, because we went through at least five kegs that afternoon and i used up the remainder of them that night and on sunday. we served the beer in a quonset hut, where it was nice and shady with a nice breeze, and the bar was next to the t-shirt table and across from the food stand, so it was a pretty good location to catch everybody coming through. i got to put a lot of faces with names this weekend, as everybody there stopped by to get a beer at least once. working for the paper, i hear about a lot of people, but don't necessarily know who they are. throughout the afternoon there were various competitions relating to sheep going on in the arena outside, like sheep hooking, team ewe doctoring, ribbon roping and sheep dog trials (where the handler's on the ground) and stock dog trials (where the handler works with the dog from a horse). it's great, because it's just a community even where everybody knows everybody and they all come together, young and old and in-between, and have a good time competing and laughing at each other when they screw up. 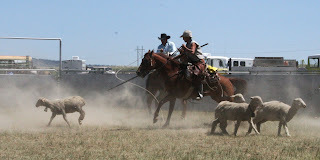 jake hooking a sheep in the team ewe doctoring competition. there are three people. one person ropes/hooks, one person ties the feet and one person takes the collar and bell off the ewe and runs across the finish line. manda had to leave shortly after the free bbq dinner was served, because of conflicts with boyfriend. speaking of bbq, i ate a lot of good beef over that weekend. the guy serving lunch concessions gave me a big ol' plate of beef ribs, then there was the bbq brisket for dinner. i wasn't really that hungry by dinner time, but i couldn't pass that up. and for some reason the cole slaw really hit the spot, too. 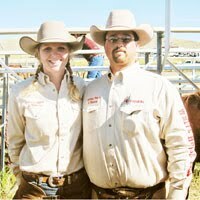 jared hendry and malcom worked the arena throughout the two days. jared's horse sulled up on him later sunday and they put a pretty good bend in a tube gate. one of bob britton's sons bridling their mustang. they live over at lysite. the nice thing about being bartender is that's where everyone congregates, so at the end of the night everybody was leaning on or around the bar and we were all having a good ol' time. everybody thinks pendleton is the best whiskey around, so my little red nalgene was passed around quite a bit and i had to go for a refill before the end of the night. despite the whiskey, i was the most sober one there come 12:30 when the band quit and we shut the doors, so i fired up the old ford and gave friends eddie and scott a ride out to trav's cattle camp, just past hell's half acre, where they were working for the weekend. and jared rode along, too, not really sure why, so i had three guys as big as me in the cab of my truck. three of us in front (jared on the console) and one in back, eddie, who i think sat on my hat. so jared and i returned to powder river, he bedded down in the hammock in his horse trailer and i put the back seat down and crawled into my truck. pancake breakfast the next morning started at 7 and i got around about 7:30. i decided i really really need to get my truck windows tinted because that would make changing my clothes a lot easier. :-) but, i did not get any pancake breakfast because i did not have $3, so i joined jake, star and star's little brother hawk for a tailgate breakfast, which consisted of a sausage-egg scramble cooked in a hub cap (no joke) over a coleman grill on star's tailgate. oh, and served up with a pepsi can fashioned into a scoop. it did the trick, tho. in jake's words: that'll make a turd. the beer business wasn't nearly as brisk all day sunday, so i didn't spend much time behind the bar. i did wander the grounds visiting with people, and getting people refills when they needed them, especially trent, who's very ranchy-looking, and malcom. i got another free lunch from the food stand guy, this time soft-shell tacos that had tempted me the day before, and spent a good amount of time on the bleachers with various people, taking in the day's competition and getting some photos for the paper. ross, who's the one packing from cody to las cruces to raise money for st. jude's children's hospital. 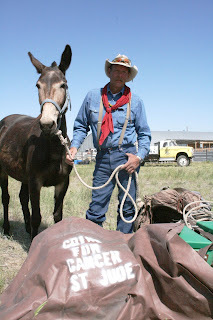 shown here with one of his mules, a part of his four-animal string. i left good ol' powder river about 4 p.m., and good thing i did, because not long after i got back to town i crashed, big time. i was so worn out and sunburnt and exhausted. but, i did not go to sleep before friend D had the chance to stop by and say hello. good to see him, had been a while. so, recently freed from any social obligations in my evenings due to lack of male company at the moment, i had an entire, gorgeous wyoming evening to myself last night. first order of business after work - eat. i'd been so busy finishing things up for the paper yesterday that all i had between the hours of 8 a.m. and 5 p.m. was a small handful of almonds and a pepper cheese stick. anyway. i ate dinner, a spinach salad and half a pork chop i'd grilled the night before, then headed out to my horse pasture. because jazz is still slightly off on her off hind i walked her a little, then got the bright idea i was going to catch robert's horse scooter and ride her a bit. problem number one - she's impossible to catch on foot. as evidenced by robert's occasional fury. :-) so i tried the on-foot strategy, keeping her running in circles around all the other horses. yeah, that meant i had to run, too. so that got old pretty quick and i caught april, hopped up on her and continued to keep scooter on the move. now, scooter likes to play hard-to-catch, but she's really quite lazy, so the thrill of running away soon wore off and it became work for her to evade us. presently i let her stop, slid off april and walked right up to her. victory was won! the poor old sorrel gelding that's in love with her and thought he had to follow her the whole time was sure beat and breathing like he hadn't moved that much in at least three years. by that time both april and scooter were pretty sweaty, so i gave april a 'thanks' and transferred her bridle over to scooter and hopped on. scooter and i worked a little bit on 'no, i'm not going to yank on your mouth and you can trust me, just calm down and try to figure out what i want when i pick up the reins.' she's a really pretty blue roan mare, well-muscled, but she's hancock bred, which means she's hard-headed. she lives up to her blood lines, but i think with patience and gentleness i can get through to her, where she'll actually let me communicate with her. by the time i walked out of the pasture i was wishing i had brought a change of pants - sweaty horses in 80-degree weather. changed my pants, then left my apt about 8 to go back to the roundup office to clean for a little over an hour. got home and went to bed at 10, only to be awakened by crazy friend D at 12:30. (note - i hadn't heard a peep from him all day. nor have i this morning) but yes, he felt the need to send me several texts, then call me after 2 a.m. on his way home from the bar. he got pretty lit last night, which is unusual for him. thus the phone calls. :-P he avoids those when he's sober now, apparently. but, i admit, i've been guilty of calling and texting him half-soused so i guess it's a give-and-take. event to start getting excited about: brad paisley's new album, 'american saturday night,' releases next tuesday!! event to cross fingers about: in march i won concert tickets to blackhawk at the beacon here in casper, but now i'm aiming for bigger fish: kenny chesney and jake owen at cheyenne frontier days in late-july. event that i should maybe be dreading, but i'm not: powder river sheepherder's fair. i went out there two summers ago to take photos for the roundup and was there for two hours, tops. my, how things change, because this weekend i'm going out as a volunteer to serve *adult beverages* for the evening festivities/bbq/dance. i'm headed out saturday morning, going to spend the night in my truck and come back whenever i feel up to it on sunday. i'm sure i'll have photos to share. i already have two bottles of whiskey - crown and pendleton - in my truck to contribute. how i got roped into this is friend jake is on the committee, and asked if i could come volunteer for the community event. my how that sounds like an upstanding community service, no? :-) and friends casey, stuart, justin, john, molly, kelly...and many others will also be out there. and maybe crazy RK? let me tell you a little about crazy RK. i help his family with cattle work a few times a year - he's 30 - and he has the most out-of-control four-year-old boy named billy that you will ever see. it's been cute up to this point, but i think impending problems will come with his bigger size. so anyway, i ran into crazy RK in the beacon several weeks ago, and he was telling me about his garden. yes, he likes to grow vegetables, it's what he does in his spare time and to relax. unexpected, no? but, then he starts telling me about how he planted some weed in his garden last year, and the deer came in and that's the only thing they ate - didn't touch anything else. (at first i thought he was saying 'wheat,' then realized my mistake) he was very upset. so apparently this year he went overboard when planting and has several acres of vegetables. he's asked for help in tending to it, which is fine with me, because they always share with the roundup office. i'm not sure if there's weed included in this year's crop. and if there is, i'm not sure if that's included in the sharing agreement. so there's this guy, ole, who is a friend of friends of mine, and that's how we met. he works for the blm as a wildland firefighter, but i'm beginning to wonder about those boys because some of them i've gotten to know are kind of strange...but others are pretty fun. and they're good dancers. so anyway, ole shows up at the bar and hangs out with me and kelly for a bit. casey was there, so i talked to him a little. and louisianan paul and texan chris, the welders who live at wamsutter, were also there, and i said hello to them. get in the truck, ole. then i had to drop kelly off first because she lives in paradise valley on the west side of town, and ole lives on the east, near my place. so ole and i pull up in front of his house and he asks if i want a tour because he and his roommates just moved into this new place. it's 1:30 in the morning, ole. get out of the truck, ole. go to bed, ole. sure, maybe we can have lunch sometime. good night, ole. 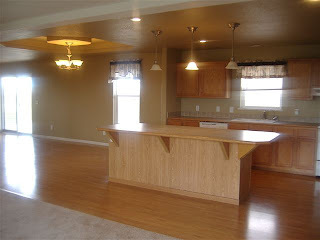 is the kitchen not gorgeous? 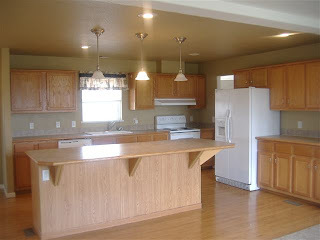 (yes, i realize it has white appliances but the kitchen's so bright otherwise that i feel they're ok) it's got three beds, 1.75 bath, and tons of living space. 1,855 square feet. count 'em. 1-8-5-5. that's, like, three times what i've got in my apt. can you imagine? so i was talking it over with coworker andrea this afternoon. if i had one roommate, i could charge $400/month. if i had one boarded horse, i could get $100/month. both very reasonable rates for casper. if i got one roommate with two horses, that could be $600/month. if i got one roommate with horse, and one roommate without, that'd be $900/month. and a monthly mortgage payment on something like this, if i could get the sellers closer to the high end of my budget at $200,000, would be around $1,000. sounds doable, no? and, if worst came to worse, i could swing all $1,000 on my own out of what i make each month, but i'd have to sit at home and knit until i could work something else out. :-) but, i already know i can do that, right? and i realize it has no landscaping to speak of, but that's a small allowance that i can work on at a slow pace. the days of watering my flowers in the morning so they don't burn up during the day, sleeping with my windows open and enjoying sunsets clear into the 9 p.m. hour are here, and i love it. yesterday turned out to be a long day - i didn't get back into town until 5:30 and i promptly went home and took an hour nap. i think the heat kinda took it out of me yesterday, esp since the air in the blazer (the roundupmobile) isn't currently working. 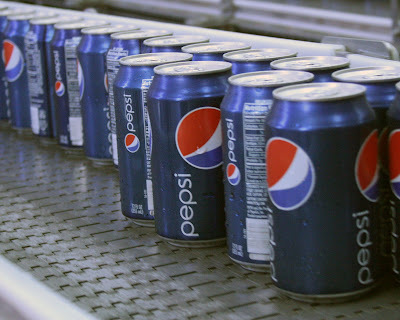 i arrived in worland on time, by 11, yesterday morning and met with the vice president of admiral beverage, which makes all the pepsi products for the region. in addition to pepsi and mountain dew they bottle aquavista water from the aquifer near ten sleep and other juices, sodas, lemonade and tea. after the interview i asked if i could have a tour of the factory, and he obliged. the machines on assembly lines fascinate me. i also walked out of there with two 12-packs of mt dew throwback and pepsi throwback, which are the products made with wyoming sugar. so, buy some! esp if it says it's made at the worland, wyo plant on the can/bottle. following the pepsi factory i grabbed lunch and called david stoner, manager of the arapahoe ranch, to see if he was around for the interview. he was, so an hour later i was northwest of thermopolis, near hamilton dome, on the ranch owned by the northern arapahoe tribe. turns out he's a talker, so i was there until 3, thus the late arrival back in casper. my main reason for going there was to discuss their supply of organic grassfed beef to whole foods in the rocky mountain region - they're on their ninth shipment of 40 head this week - but, of course, the conversation ranged widely from that. 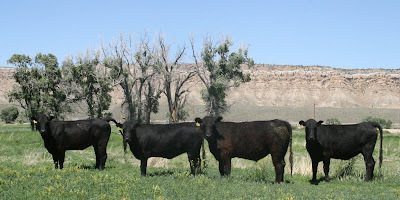 pictured below are a few of their steers that will head to the front range for processing within the next few weeks. they have 3,500 mother cows that run on i don't know how many acres, but the ranch is vast. their bull pasture alone is 33,000 acres, to give you an idea of its scope. apparently the pepsi factory in worland uses sugar produced from wyoming sugarbeets in their products, so i'm going there today to check into that whole situation. our idea is that the red, white and blue pepsi can/logo will make a perfect 4th of july cover photo for the paper. also, i'm trying to get an interview in thermopolis on my way back through. it has to do with the arapahoe ranch, of the wind river indian reservation. 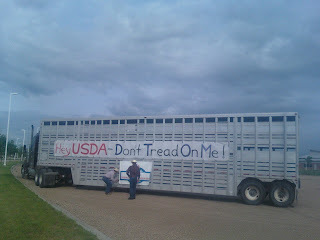 they raise organic beef and recently landed a contract with whole foods. not sure if that one will work out yet. another bright sunny wyoming morning today, we've had several of them in a row now so maybe our month of rain and clouds is over. it's officially summer as of yesterday! that's exciting. 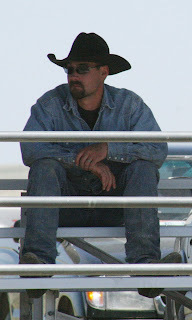 been enjoying attending the rodeo this week. . . went for the third time last night, going again tonight with roommate manda, her boy and another girl named tanya. last night i brought my camera and tried to get some photos of the wyoming kids, although i wasn't in very good places for lighting because i was having a really hard time getting my camera settings right. met friend D again there last night and watched the performance with him, he also has a pass to get him into all the nights becuase he helped set up the arena. following the rodeo i headed back over to the beacon and settled in until the wee hours...wasn't going to, but a certain roommate showed up and was in the mood to tie one on, so i ended up sticking around and taking the occasional shot with her. 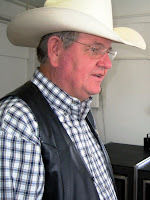 leon coffee, a popular rodeo clown who works a lot of events in wyoming. nikki steffes of university of wyoming in the goat tying event, in which she's in the top five, i think. she's also in the top of breakaway roping, and doing well in barrel racing. i wrote an article on her, and she's a great girl. once again, it is that time of june where all the kiddos converge on highland park for a week of fun-filled games, snacks and songs. for the third year i'm doing what they call the 'spotlight drama,' where i have a script and get the kids to do certain poses and i take photos of them and upload them to a slideshow that's already synced with a song and they watch it all in their big group at the end of each day. it's kinda fun to do, and it's one of the only things i volunteer for right now. today was day four, one more day to go. i leave work about 9 each morning and it only takes about an hour. while i was at the church this morning i took a few moments to chat with don, who's my boss when i work at church. i was telling him i was looking for a place to buy, and we had a discussion about casper's housing market, and how he just sold his house, and how he thinks the market has at least another year of decline in casper, because most of the time wyoming's a few years behind the rest of the country. so, i guess i keep looking and waiting for something to come along that feels like it could be home. i've looked at a lot of places that could work, but none of them really fit well with my plan, and i guess i'm not in too big of a hurry to find a place, now that i've pretty much decided i'll sign another six-month contract with my apartment. maybe if i wait longer some of those pretty decent places listed at $270K will come down under $200k and, therefore, into my price range. there's this tack shop in town called moss saddles & tack, run by susan and jerry moss, who advertise with the roundup and who also go to highland park. 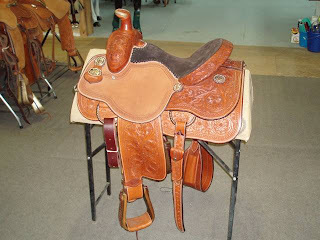 every time i go in they try to get me to buy a clay o'brian cooper saddle by cactus saddlery. i'm reminded of this because they have a booth at cnfr and i sat in one last night. i really want it. it's pretty...see? this one's about like what i've been looking at. $1800 will buy it, they say. so far i've resisted. we'll see how long i can hold out. seems like whenever i leave town for several days i return feeling very disorganized. my apartment needs to be cleaned, i need to organize my 'to do' list for the roundup, and it feels like there are about 23432 other things i need to do that i can't think of right now. the trip to western wyo was a success, despite rain and snow. my dad and i arrived back in town at 5 yesterday afternoon, after a five-hour drive from pinedale. yesterday morning before we left we went riding once more with melissa out on the blm ground near the ranch, and it was a gorgeous morning where we could see both the peaks of the wind river mountains and the wyoming range to the west. after unloading and unhooking we went over to the events center for the college national finals rodeo and ended up watching it with dejoe. it struck me while my dad visited how many people i've gotten to know in this town, because now everywhere i go i run into someone that i know: murdoch's - the ranch store, sportsmen's warehouse, driving down the street, the rodeo, the beacon, the rodeo parking lot, even at the western store clear over in pinedale. it's nice to be in a place long enough for that to happen, now i'm starting to feel in casper how i used to feel in ames and it's kinda nice. another thing that struck me today - i've got this random quote generator on my laptop's dashboard, and this one came up today: "absence - that common cure of love." how true that is, as i found out in the messy end to my relationship with ex-boy. one doesn't all the sudden wake up one day and realize you don't love someone anymore, either. but, after two year's absence, i didn't love him anymore and that was a stark realization that didn't come until after we stopped talking. i had realized prior to that that the thought of splitting with him didn't really cause me much pain, but i was still too close to the situation to realize why. *sigh* but i still sing that country song "don't think i don't think about it." i still don't know fully what happened, but i'm postponing processing that. 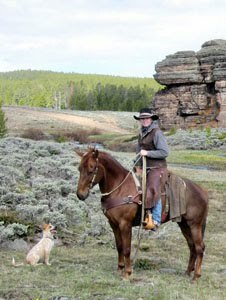 but, for now, i've got a busy life in wyoming and i must get back to writing my article about the wyoming high school rodeo association. and casper just got nailed with a thunderstorm that noaa says dropped two to three inches in the last two and a half hours.....i dunno what's up with wyoming, but something's gone haywire with the weather. it's 55 in casper right now, but i'm not there. i'm south of pinedale near boulder, in western wyoming, and, surprise, it's now 37 degrees here. and we've had rain. all afternoon. like three big thunderboomers. i'm ready to go somewhere sunny. and warm. and not rainy. and not gloomy. but - life goes on. my dad came out to wyoming to visit me and my sister melissa for a long weekend. he arrived in casper last night about 6, and we drove over to western wyoming today, taking about four and a half hours to make it to the west side of the wind river mountains. thankfully we did have a pretty nice drive, as we didn't run into any serious rain clouds and he got to see some of the country, and the mountains were visible. we even saw a few moose coming through south pass, and that's an unusual sighting. last night after dad arrived we went to casper's poor boy's for steak, then dropped in to the beacon club to see what was going on and check out the live music. he met friends stuart and casey. :-) and kelly and lea. and the people that i know there were all asking me why i couldn't stay long. :-P i guess they're kinda used to me getting comfortable for the duration. so anyway. 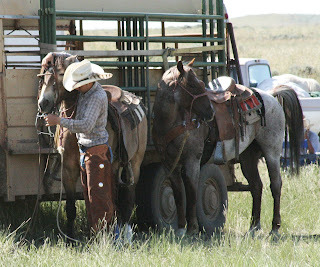 we got up this morning, ran some errands, got the horses, and off we went. after arriving here at the ranch my dad helped melissa fix her bronco, which is perpetually in need of repair, and tonight we went into pinedale to stockman's, a restaurant in town, for steak with the rest of the people who work with my sister for three peaks ranch, an operation of the national outdoor leadership school, or nols. the plan while we're here is to go riding in the mountains, but hopefully it doesn't rain when we want to go. we'll see. oh yeah. it also hailed twice today. now i don't know how many i've gone to see. i've kinda lost track. went to see one on saturday, one on sunday. the saturday one won't work, because it doesn't qualify for rural development funding because it has a casper address. the sunday one needed work, but had some nice paddocks, but the reason it fell off the list is it's in a place called rolling hills, north of glenrock and 25 miles from casper. 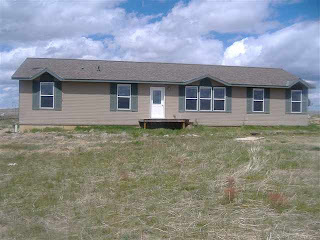 my realtor sent me another one yesterday that's in bar nunn, which would qualify for rural development, and it's on 1/4 acre but the covenants are such that i wouldn't be able to put up a shed and run to keep the horses in the winter. speaking of the horses - when am i supposed to ride with weather like this? "as i fly over the state, i’ve decided i’m not the governor of the wyoming i know, but i've been transplanted and i'm suddenly the governor of ireland. i guarantee there’s grass between here and shoshoni, and in the red desert. whenever there’s a drought all of you come and pound me in the chest, then when it rains everybody says praise the lord. There’s an inequity in that," he joked. the last two days i've spent listening in on the conference entitled "building the wyoming we want" - a gathering of the state's leaders to bring a central and unified focus to the direction in which wyoming will move through economy and population shifts, among other things. most of it was actually pretty interesting, and i like being in on things like that instead of being a part of the general public's casual ignorance. how are we already a week into june? that's crazy. 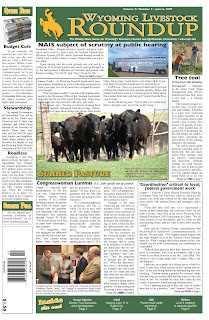 we already had one paper go to press and seems like it was still may yesterday...by the way, this is what my newspaper looks like, the june 6 edition. you can also visit the website, which is www.wylr.net. and make counter-accusations. let's just say that's timely advice from my buddy stuart, shared over a couple of beers last evening. i go to look at another house at noon today. my realtor and i went over there to look at the place last night, but couldn't get in the house. it's worth checking into more, so we're going back today. it's a horse property with three-bedroom, two-bath house. it's only on a little more than two acres, but that fits my plan of keeping the horses with me in the winter and turning them out on galles's pasture in the summer. it's in west casper, an area called indian springs, with a good view of the mountain and sunset to the west. currently i sit at my second job with highland park community church. there's a memorial service going on so i had to get here at 9 and wait until it's done, then i'll come back for my usual 3 to 7 for the saturday evening service. it's finally a sunny day here. it's been, like, a week since we've had that and i was very grateful to see blue sky this morning. yesterday morning was another early one - alarm went off at 4, rolled out at 4:15 and was heading south out of town to cheyenne by 5. the reason i went down there was to attend a meeting of the state board of land commissioners meeting, which is chaired by governor freudenthal. while sitting there, half-listening for pertinent information and half-typing out articles for next week, i noticed these two guys come into the room and one looked really familiar but i couldn't place him. turns out i had randomly met him last weekend in the wonderbar here in casper. small state, right? he lives here in town and works with landowner associations on wind leases. and now i remember his name. john eric. following the meeting i walked over to the state archives to inquire about using their historical photos for the paper upon request, and then i made my way up to the cheyenne frontier days museum to look for article ideas. after a stop at the mall to see what was on sale at the cheyenne boot barn - i bought a pair of cruel girl jeans for $20, originally $64! - i headed back to casper. 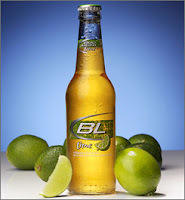 the rest of my evening was rounded out by several hours spent at the beacon's happy hour with bud light lime and fresh tortilla chips and salsa, joined by friends rick, casey and kelly. i've finally put the flower photos from my camera to my computer, so i've uploaded some of them. i'm quite pleased with how my container garden turned out this year - lots of green, and hopefully color in the near future. since i planted them it's been cloudy and cold round here, so i'm really hoping the sun comes out soon and starts them blooming. i don't remember the names of most of what i got - i just wandered through the greenhouse and picked the ones that looked pretty. :-) although there are some trailing petunias, moss roses, gazanias (if that's how you spell that), dusty miller, strawflowers and many other things. aaand......bonus pictures of the kitties helping me decide what to plant in which pots. yesterday was another beautiful summer day. i got up early and cleaned up my apt a little bit, then took a little nap before planting all the flowers i bought at the greenhouse saturday morning. i spent $60 on them, but they sure look nice. i don't have the photos on my computer yet, but i'll post some later. 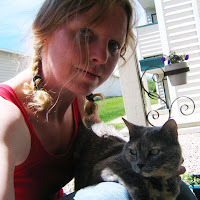 the cats also enjoyed being outside and helping me get it done. after flowers i cleaned some more and putzed around, went to bed, bath and beyond in the mall to get a belt hanger and to ross to browse around. i ended up buying a yellow blanket, some pillow cases and a really cute owl i couldn't resist that's ceramic and has holes in it for a votive candle to shine through. then, while i was planting my flowers i dismantled my satellite dish so i took it out to jake's place because his cattle keep rubbing on his and it's beat up, i guess. if one goes to visit jake, you better either have a real good reason you gotta leave and go somewhere, or have all the time in the world. 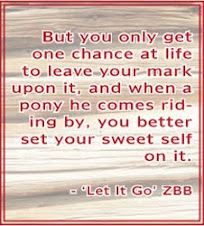 turns out i had all the time in the world, so i stood by while he doctored and trimmed a green horse and then we saddled up and went riding in his family's pasture to the west. so, because i was too busy enjoying the day, i canceled my hotel room in loveland for last night, deciding to get up early and drive down this morning for a meeting starting at 9. my alarm went off at 3:30 a.m., but i didn't get up until just about 4. i got up and showered, dressed, ran over and got the roundup's chevy blazer and was on my way out of town by 4:33.
so that's going to be my day. i'm headed back to casper this afternoon.